Covering much of modern day Yemen, the Sabeans were an ancient people who lived in the south-western part of the Arabian Peninsula. As a centre of culture for thousands of years, and growing rich from the trade of frankincense and myrrh, they were a visually cosmopolitan civilisation. Small figurative statues are common throughout the empire, which were placed in tombs and temples as votive offerings. Some, such as this rare and intriguing example, hold empty boxed, in to which offerings would be placed. These acts of piety would invoke the favour of the cult gods, but also acted as conscious displays of the donor’s wealth and social status in the public sphere. It has also been suggested these female statues could represent the Queen of Sheba, who came from this province, and whose journey to visit King Solomon is recounted in the Old Testament. 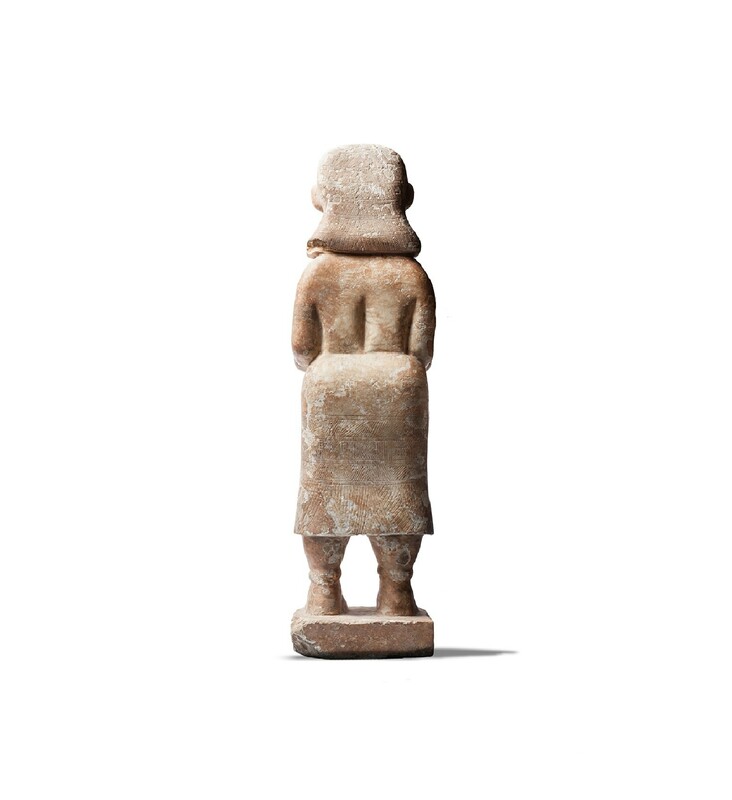 This majestic statuette stands frontally with its feet placed firmly on a small rectangular integral plinth, wearing a long dress that finishes at the figure’s calves. Applied with a layer of gesso over the marble, she has been incised with cross-hatched and linear bands of decoration suggesting necklaces composed of triangular pendants, and a large crescent pendant hangs centrally above her bosom. Her arms are bent at the elbow, projecting forwards holding a geometrically decorated hollow rectangular votive offering bowl. Her oval face with pointed chin is placidly composed, with a strong brow and stylised nose. The large almond eyes are deeply set, and contain drilled pupils that may have once been inlaid with precious stones. The face is also incised with linear bands of decoration, and a beaded diadem crowing her heads signifies she is a goddess. Her hair flairs out behind her head, and has been incised with a symmetrical pattern as it falls to her shoulders. 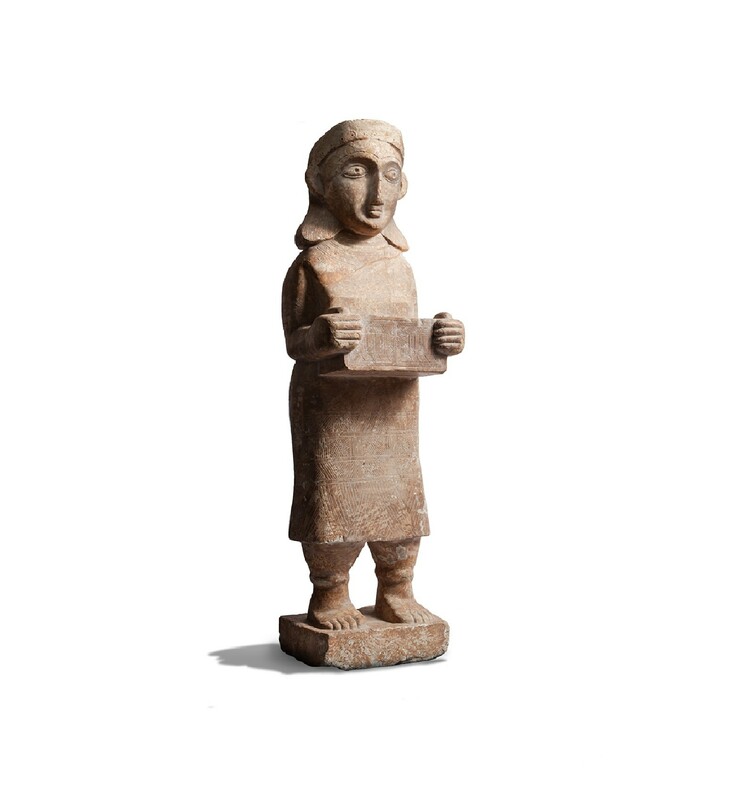 The monumental size of this statue indicates that it would have once been owned by a wealthy individual, keen to both invoke favour with the gods, but also declare their success in life through their material culture. The National Museum of Aden contains a Sabean votive goddess statue, called ‘The Lady of ad-Dali’, which is a limestone figure somewhat smaller than this, wearing a full length dress, but with a similar arrangement of jewellery. 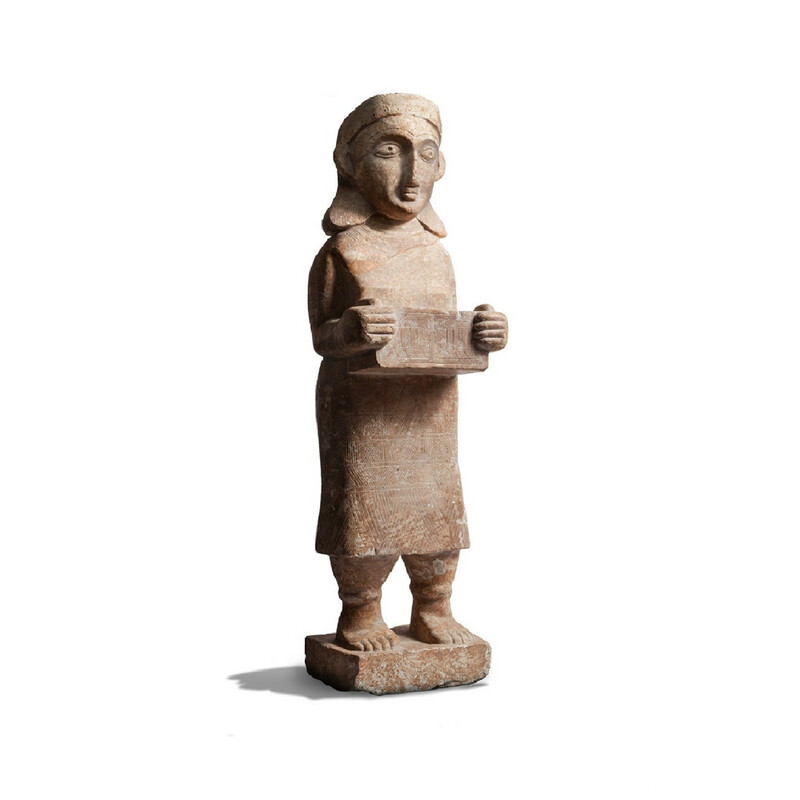 Although now missing, the poise of her arms suggests she would have once held a box similar to this example, containing offerings to the gods. The Metropolitan Museum of Art in New York also contains an alabaster Sabean male votive figure, of similar stylised appearance and quality, with an inscribed base, suggesting each statue had a specific persona, perhaps to invoke a specific goddess, while the variety of materials indicates varying budgets. 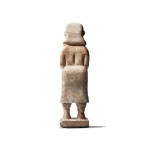 The crudeness and decay of the Aden example and the simplicity of the Metropolitan Museum example highlight the excellent museum-worthy craftsmanship and condition of this statuette. This piece was once in the private collection of Lucien Deloyers (1901-1982), who was a well-known surgeon, professor and member of the Royal Academy of Medicine of Belgium in Brussels and his wife, Irene Deloyers, who was a violinist. Together they built a superb and extensive collection of ancient art while travelling Europe and Asia throughout the 20th century. P. Monaghan; Goddesses in World Culture, Vol. 1, ABC-CLIO, 2011, p.252. 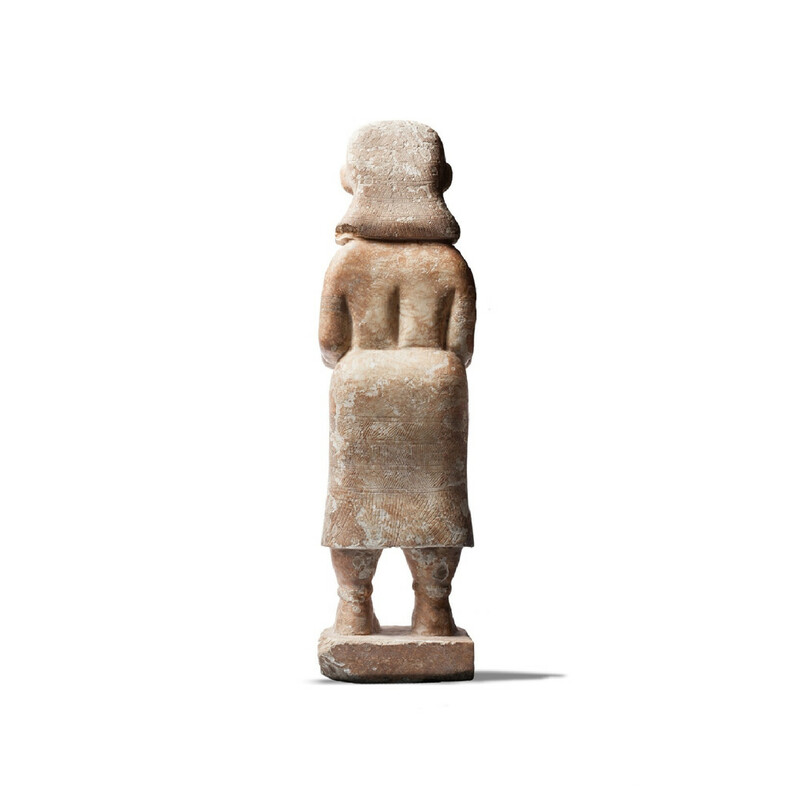 The Lady of ad-Dali, limestone Sabean statuette, National Museum, Aden, Yemen, 1st century BC., H: 54 cm., NAM616. S. Simpson; Queen of Sheba. Treasures from Ancient Yemen, The British Museum, London, 2002, p.119, no.130. Previously in the Lucien (1901-1982) and Irene Deloyers Collection, Belgium, acquired circa the 1950s. Gifted to a Belgian family in the early 1960’s. A prolific Surgeon and Grand Officer of the Order of Leopold, Knight of the Legion of Honor and Commander of the Order of Academic Palms, Lucien Deloyers (1901-1982), a native of La Louvière, was proud to add that he was a member of the "Arts, Sciences and Humanities Society of Hainaut" and that he was laureate of the five-year Hainaut Prize in 1960- 1965. Together with his wife Irene Deloyers, who was a famous violinist, they built a superb and extensive collection of ancient art while travelling Europe and Asia in the mid to late 20th century. The closest related figure is ‘the Lady of ad-Dali’, a limestone figure from Shuka’ cemetery and now in the National Museum, Aden (NAM 616). Although somewhat smaller than his marble figure and wearing a full-length dress, she boasts a similar arrangement of jewellery: S. Simpson, Queen of Sheba. Treasures from Ancient Yemen, The British Museum, London, 2002, p.119, no.130. Wonders of the Sabean World, 2017.